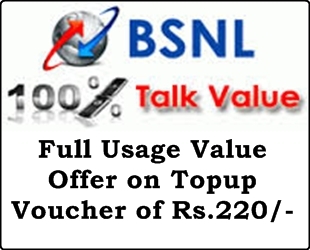 Public-Sector-Unit Bharat Sanchar Nigam Limited (BSNL) has announced Full Usage Value offer on Topup Vouchers under GSM Mobile Prepaid Services as promotional basis for limited period 10 days across Tamilnadu Telecom Circle. The Competent Authority of Tamilnadu Telecom Circle has decided to offer Full Usage Value which is equal to MRP on Topup cost Rs.220/- for Tamilnadu LSA (Including Chennai Telephone District) under 2G and 3G Prepaid Mobile Services for 10 days. This offer will be applicable on CTopup (Easy Recharge)/ Flexi Topup Vouchers of MRP Rs.220 and also applicable in paper Voucher for Tamilnadu Circle (Including Chennai Telephone District).